At Maxx Roofing we provide the best materials to choose from when selecting your Gutter system for your home or business. We provide seamless gutters in Aluminum, Copper, Half Round and also provide gutter protection. We have the products and colors to fit your every need. We custom form and cut our seamless gutters to precise measurements right on the job site to fit your home exactly. 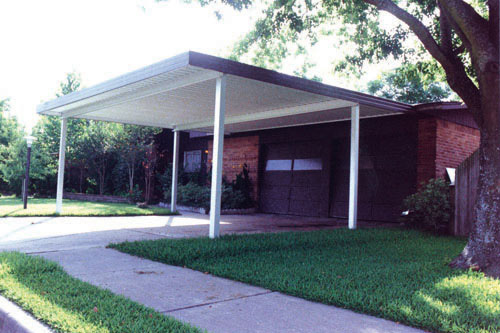 Our seamless gutters are one piece end to end except at the custom hand tabbed corners. No mitre strips are used. Other companies most often use pre-formed mitre strips, which are used to cover the gap between each piece of guttering at every corner. More caulking is then required to seal the mitre strip and gap from inside the guttering. If not sealed properly there will be leaks in the corners of the guttering, in time causing the wood behind the guttering to rot. To remedy this problem Maxx Roofing, has developed a method where the corners of the guttering are precisely cut allowing them to overlap each other from the inside while only a small seam is seen from the outside. Leaking corners are less likely since the two pieces of guttering in each corner actually overlap preventing gaps in the guttering normally caused by expanding and contracting. This method of hand tabbed corners takes considerably longer to install, but looks cleaner and is also stronger. To install our guttering we only use high grade aluminum hangers which prevent gutter sag and hanger failure. For added strength when installing our gutters, we space our hangers every 16-18 inches apart as opposed to the industry standard of 26-30 inches. These hangers are self-bracing at the point of stress and will hold up to wind, rain, sleet, snow and ice. 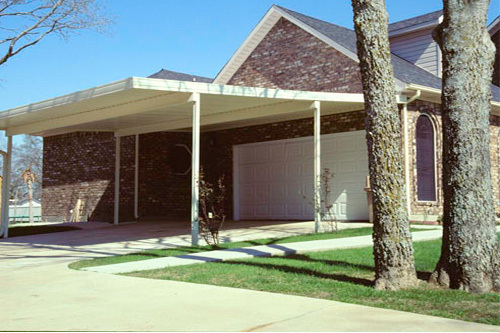 Whether you need shade from the sun, a place to enjoy parties or protection for your vehicle, Maxx roofing offers a complete line of “low to no” maintenance covers that will take care of your outdoor needs. Contact Us today for additional information, and a Maxx Roofing employee will help you select what is right for you.